Hi! Here�s a comment from the Critique Club. First impression: Eyes definitely drawn to the bright yellow, down to the eye, to the buds on the right and then to the line attachment area. Picture is busy with the plant competing for attention. 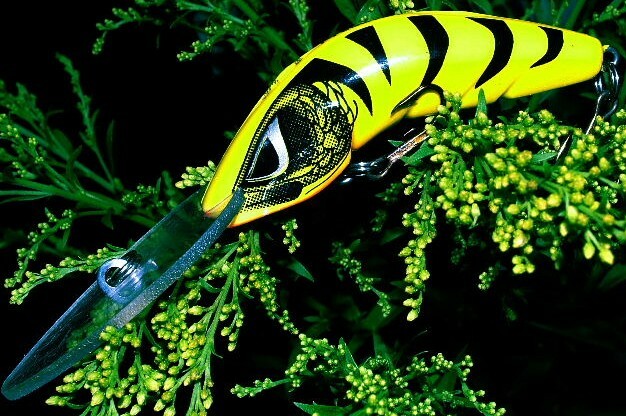 The black areas actually encourage the competition between the plant and the lure by creating such strong contrast. A different background, say a rock or a log would have given more attention to the lure. Glare from the light source is distracting. A soft or reflected light would have helped. Your colour processing and DOF work well for the lure. Cropping could be a little to tight though!. This image has a lot of things going on. Its hard not to think that color is the major element, but the limited contrast between subject and background neutralizes the effect. there also is the pattern on the lure to consider, but the shape is still dominate. Took a minute, but nice lure, got a guy at work who makes these. Proudly hosted by Sargasso Networks. Current Server Time: 04/20/2019 03:01:40 PM EDT.